When working any hand embroidery project – but especially a big one that’s going to take a lot of time and a good quantity of specialty threads – the rule of “better too much than too little” should apply when ordering your embroidery supplies. Why too much rather than too little when ordering threads for a big project? There are a couple reasons that jump out at me, and you may know of more reasons from your own stitching experiences. My reasons: 1. Dye lots: It’s always better to order a quantity of threads in the same dye lot. If you’re working on a project that takes a year or so, and you end up running out of thread and having to order it some time later, you can’t be absolutely guaranteed of an exact color match. 2. Breaking your rhythm: If you get up a good head of steam and are really making way on your project, there’s just nothin’ worse than runnin’ out of thread! When preparing for the Medallion Project, I estimated I’d need four spools of flat silk for the background. I’m using Soie Ovale, which is a flat silk produced by Au Ver a Soie. (You can see some up-close photos of Soie Ovale in relation to other silk in this flat silk thread comparison article I wrote a long time ago.) Soie Ovale comes on a 15 meter spool. It is a “single strand” thread – you use the whole strand as it comes off the spool, rather than splitting it into smaller strands. So on each spool, you have 15 meters to stitch with. The whole background filling took almost three spools of the flat silk – so just short of 45 meters. On the third spool, pictured in the photo above, where was a little bit of silk left. I wasn’t too far off in my estimate, and I was glad of the padding, too, because you never know what mishaps may occur! I did waste part of a strand during stitching – about 10″ worth – when I snagged the strand on the zipper of my sweater. It was past reparable – and I learned what not to wear while stitching with flat silk! Now, quantity-wise, I know that designs of approximately this size, with this amount of coverage, will require around three spools of Soie Ovale. I’m sure I’ll write that down somewhere, so I don’t forget! In the meantime, if you’re keen on working a similar design, you now know that you can get away with ordering three spools of Soie Ovale rather than four – not that I’m at all opposed to having an extra spool of silk lying around for the next project! Mary, I adore this project! Cannot wait to see the progression. It is enticing and has such a rich surface pattern. I love it! Keep up the good work & thanks for sharing! I always like to have more thread than I need for a project just in case I end up with knots that I can’t get out or to allow for having to unpick mistakes. I seem to make mistakes that have to be pulled out in all my projects. Hi Mary, you are absolutely right about having thread from the same lot. It happenned to me with silk. The shade was different, and also when you start let say a long leaf and you run out of thread, by the time you order your thread and the time it arrives, you do not have the same ( angle and the same way ) So I learned not to start something if I do not have enough or if I think I will run out of thread. I can’t help but see how much you’ve grown since you wrote the 2007 article. It inspires me that if even the one that I look up to grew to knowing what she does then I have the hope of growing farther than I am now. That may sound really strange because I’m not sure my words are carrying the meaning that I intend BUT I am inspired to learn and grow! I am really intimidated from working with silk. I like working with my nice crewel wool that is very forgiving and covers a lot. I order hanks instead of the little skeins of wool as I like having tons of materials in case inspiration hits for something new. I order the skeins to see if the color is good or not, and then I go on and order the hank for that particular color. Everytime I read through a catagory or technique, it is my inspiration to spend the time and be dedicated to study and practice while enjoying learning this delightful field. Thanks Mary! I have a (few) questions… how did you estimate that you needed four spools, did you do some sort of calculations or used your experience from former projects? I really like the look of the flat silk (even when it is on the spool). Can it be used for lets say long and short stitching and still look so beautifully shiny? What other kind of stitching is it suitable for? Can it be used as a substitute for the regular DMC cotton? I would really like to work with it, but haven’t got a clue on how it can be used. If you could enlighten me I would be very grateful. You’re right. It’s better to have too much thread than too little. Recently, Coats factory has moved from Germany to Hungary so stranded cotton have different colours than before. Sometimes thread You need, is no longer available. 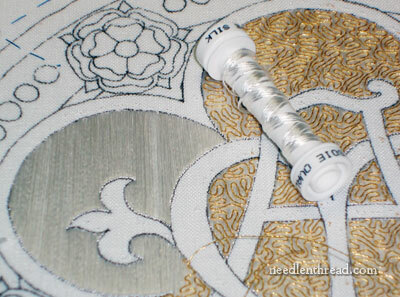 I’m usually embroidering with DMC stranded cotton – I will use all mouline I’ve got. Next Next post: A Golden Finish – er, Almost!